The terror and the shame. Photo credit: DonkeyHotey / WhoWhatWhy (CC BY-SA 2.0) See complete attribution below. Government-sanctioned discrimination has always been a tool to establish the superiority of one group of people over another. Whether it’s making a minority wear a certain piece of clothing or setting aside designated areas for them to live, eat or ride the bus. The goal is to constantly remind the oppressed that they are different and worthless. At the same time, it allows the ruling group to rally around an enemy within. Nowadays, the concept he describes is known as “Making America Great Again.” It’s a rallying cry for whites who are yearning for the days of their unchallenged supremacy. But it only works if there is a “bad guy” and since the very first moment of Donald Trump’s campaign, it’s been clear who that is. The president has been targeting Hispanics as his favorite “other.” His message that Mexico is “not sending their best” — but rather criminals who are bringing their problems to the US — has been relentlessly amplified by Fox News and soaked up by his supporters who need somebody to blame for their own stagnating fortunes. To this segment of Trump’s base, Hispanics are a bunch of criminals and gang members that steal jobs and use government services while hard-working Americans are footing the bill. None of that is supported by the facts but it is a convenient story for those who need an excuse to look down on immigrants. Not that there hasn’t also been subtle and not-so-subtle racism directed at African Americans, but Hispanics are a much better target — in particular for state-sponsored discrimination. After all, some of them committed the “crime” of crossing the border in search for a better life. And while it is now illegal to tell blacks to sit in designated spots on the bus, having immigrations officers board a bus, ask for proof of citizenship and remove a woman from the vehicle does not violate the law. In this case it was somebody’s grandmother and not a dangerous criminal. That seems to be a pattern for Immigration and Customs Enforcement (ICE), who are not just going after the worst of the worst. Instead, because there are only so many bad hombres, ICE often targets people who have done nothing wrong while in the US. That, in turn, is causing millions of people to live in fear of being next. Just imagine having to worry constantly that somebody will knock on your door and end the life you made for yourself. Like Jorge Garcia, who was deported earlier this month. He came to the US as a child and has lived there for nearly 30 years. He has a wife and two kids — all of whom are US citizens. And that’s where Trump’s “America first” policy is exposed for what it is: a hollow nationalistic slogan. Because who is benefitting from Garcia’s deportation? Certainly not his American kids, who now have to grow up without their dad, or his American wife, who has to make do without her husband. The only immediate choice to keep the family together would be to uproot it and move it to a country where all of them would be strangers. None of this is making America any better. It only serves to give Trump’s supporters somebody to look down on while driving a racial wedge through the country. 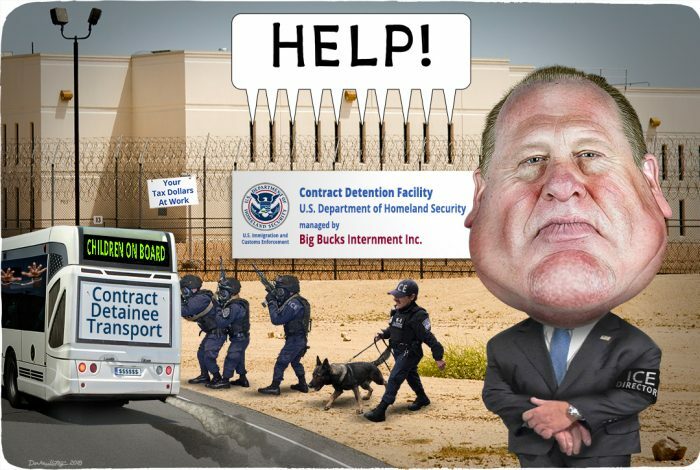 The cartoon above was created by DonkeyHotey for WhoWhatWhy from these images: Thomas D. Homan caricature (DonkeyHotey / Flickr – CC BY 2.0), detention center (Anthony Albright / Flickr – CC BY-SA 2.0), bus (Alexandre / Flickr – CC0 1.0), SWAT team (US Army) and kanine team (U.S. Customs and Border Protection / Flickr).